Peppermint Essential Oils is one of the most highly regarded herbs supporting healthy lifestyle*. I personally like to use it to promote clarity and energize my brain. During the hot months, I put a drop or two in my drinking water, or make a cooling mist to spray my skin. It is also a key oil in the Raindrop Technique. Use peppermint oil to soothe muscles after exercise or make your own sports massage oil to support your exercise routine! This section is a fun and easy reference guide for Peppermint Essential Oils. It will tell you how to use it and what to use it for. It will also provide you with some fun suggestions, safety precautions for you and your pet! 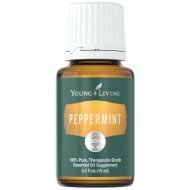 Want to Purchase Therapeutic Peppermint Oil? Buy Peppermint Essential Oil Here! Why is this information important? There are several different many different hybrids of Peppermint that are grown all over the world. As a matter of fact, most books note that Peppermint may actually be a hybrid between the water mint and spearmint plants. Some companies may try to substitute a species within the family and try to sell it! So make sure you know your source and you are purchasing the right genus species! Where is the name derived from? Peppermint comes from a Latin word "mente" meaning "thought". Did you know that Peppermint was one of the ingredients found in "Four Thieves Vinegar" or "Marseilles Vinegar"? What are the Plant Properties? Uplifting, energizing yet soothing. What are the Documented Uses for Peppermint? Massage after workout. Raindrop Technique. Cooling and refreshing healthy skin. What is the Aromatic Affect on the Mind? Aromatic scent is fresh and cool. What is the Spiritual Influence? Small amounts of peppermint essential oils can cleanse the spiritual bodies and increase attunement with the soul so that intuitive awareness increases. Fears may also be minimized, especially those having to do with motion (riding, skiing, and flying). What Chakra is Affected? Root, sacral, solar plexus and throat chakras. What are the corresponding Chakra Colors? Green and violet. Interested in Dietary Peppermint for Your Culinary Adventures? Or For use as a Dietary Supplement? Then check out Peppermint Vitality Essential Oil! Can this Oil be used for Pets? Yes. Have your animals smell it directly from the bottle or place a drop or two in your palm, then smell. Or place a drop in your palm and pet head to toe. Use for car and trailer rides! What are the Safety Precautions? First, only use therapeutic grade essential oils! Peppermint essential oil is Generally Regarded as Safe (GRAS). It is approved by the FDA for use as a Food Additive (FA). Watch your eyes or cuts when using peppermint oil! Place a pure vegetable oil on location if irritation or stinging occurs. Do not use water! It will worsen the symptoms! Peppermint oil should not be used on children younger than 6 years of age and should be avoided if a person has high blood pressure. May cause skin irritation, therefore dilution is recommended. Use cautiously during pregnancy. Did you know that the genus name for peppermint comes from a Greek myth? The story tells that the nymph, Mentha, who was pursued by Pluto, was crushed to dust by his wife Persephone. Pluto changed her back into a sweet smelling peppermint plant! Did you know that Dr. Dembar from the University of Cincinnati, studies the mental accuracy of students when inhaling peppermint oil? Want to Purchase Therapeutic Peppermint Essential Oil? Go to the Oil Shop! Buy Peppermint Oil Here! Place peppermint oil on epsom salts with eucalyptus radiata or lavender for a soothing bath and spa treatment! Click below to see contributions from other people who have tips on how to use essential oils! They were all written by visitors of the website.